MORRISVILLE, N.C., November 8, 2018	(Newswire.com) - SunTech Medical, a manufacturer of blood pressure monitoring products and technologies, announces the launch of Small Adult PLUS blood pressure cuff, completing the full range of PLUS blood pressure cuff sizes. SunTech PLUS Blood Pressure Cuffs offer complete coverage for adult patients from lean to bariatric with just three cuffs. The PLUS cuff range is built to the latest American Heart Association guidelines on cuff accuracy and validated to the newest EN 81060-2:2013 protocol. The 3-cuff PLUS range replaces the need for adult cuff sizes from Small Adult to Large Adult Long and Thigh, eliminating the need for 6 or more cuff sizes. By reducing the number of cuff sizes by half, hospitals will need to order, track, and stock fewer SKUs. Additionally, selecting the correct cuff size will be easier for clinicians, which could reduce inaccuracies in blood pressure measurement. 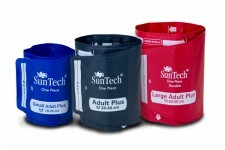 PLUS Cuffs are available in Disposable, Vinyl, or Durable materials and also in SunTech’s range of industry standard connector styles. Hospital Systems and IDNs can now streamline their BP cuff logistics with fewer SKUs and industry standard connectors from SunTech. Contact us to discuss the evaluation and conversion to SunTech BP cuffs. Headquartered in North Carolina's Research Triangle, SunTech Medical is a manufacturer of clinical-grade, non-invasive blood pressure products and technologies.